. . .hese qualities were tempered with real religion. 'You must be in the blues!' exclaimed Gwen, with a laugh. 'No,' said Clare, looking up, 'I am not, at all. I am longing to be up and doing, and leave some mark behind me as I go. Is that Browning you have in your hand? Just let me look up a passage!' Gwen laughed again as she handed across the book. And for an hour Clare sat amongst the piles of books with her fair head resting against the carved cupboard, and not a word or sign could Gwen get out of her. Elfie spent her time in helping Agatha to unpack, and it was a very tired little party that gathered round the drawing-room fire that evening. I enjoy reading books from previous centuries and I really liked this one. The over-story was good and easy to get into., while the religious under-story wasn't obnoxious. The characters are engaging. The story of 4 sisters and the journey God takes them on to know and trust Him more. 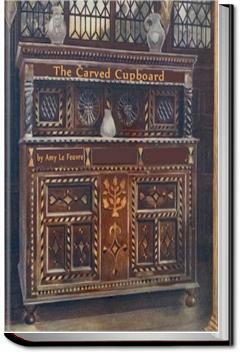 The Carved Cupboard was a charming story that reminded me much of Little Women. It had sisterly affection, family ties, a little romance, and a little mystery. As well as redemptive factors. It was a quick cozy sort of read, and I enjoyed it.